In Sleepless in Hollywood, a veteran producer takes a witty and critical look at the new Hollywood. Lynda Obst dishes on the experts, tastemakers, and moguls of today's Hollywood and the movies they make. She describes how the movie business has lost its MO — and is now losing its talent to network and especially cable TV. Over the past decade, Lynda Obst gradually realized she was working in a Hollywood that was undergoing a drastic transformation. The industry where everything had once been familiar to her was suddenly disturbingly strange. With prequels, sequels, and trilogies crowding movies theaters, the aphorism “They don’t make ‘em like they used to” has never felt more true. Why is that? That’s what the producer of more than 16 feature films wanted to know when she began researching the changing dynamics of the movie industry. She details her conclusions in Sleepless in Hollywood: Tales from the New Abnormal in the Movie Business about living and working in an industry that has been radically changed by technology and globalization. Lynda Obst speaks from the front lines. Her subjects are friends, moguls, former employers, mentors, and even relatives, who express their opinions with disarming bluntness and hilarity. Combining her own industry experience with insights from the smartest people in the business, Obst explains what has stalled the vast movie-making machine. The calamitous DVD collapse helped usher in what she calls the New Abnormal (because Hollywood was never normal to begin with), and studios are now heavily dependent on foreign markets for profit. The business reacted by producing tentpoles (mega-hits) or tadpoles (which nobody gets a chance to see), a situation which directly impacts the kind of entertainment we get to see. Why are studios making fewer movies than ever — and why are they bigger, more expensive, and nearly always sequels or recycled ideas? Since the majority of their revenue comes from the foreign market, especially Russia and China, studios have refocused on special effects and 3D over expensive actors and writers. 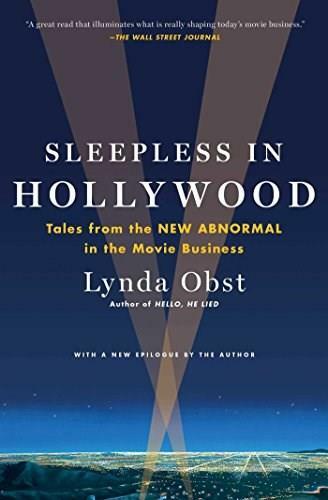 Lynda Obst writes with affection, regret, humor and hope, and her behind-the-scenes vantage point allows her to explore what has changed in Hollywood like no one else has. Special effects and 3D replace people. Can comedy survive if they don’t get our jokes in Seoul or allow them in China? This candid, insightful account explains what has happened to the movie business, and explores whether it’ll ever return to making the movies we love — the classics that make us laugh or cry, or that we just can't stop talking about. Lynda Obst was an editor for The New York Times Magazine before entering the film industry. She has produced more than sixteen feature films, including How to Lose a Guy in 10 Days, Contact, The Fisher King, Adventures in Babysitting, Hope Floats, and two films with Nora Ephron, Sleepless in Seattle and This Is My Life. She is now producing television as well.